Multiple languages is available on Professional and Enterprise. These plans enable you to select multiple languages, which are used to determine the language used in system messages and email notifications that are generated by your business rules. You first configure your account settings to support multiple languages, as described in this article. You then create and manage translations of all the content that is sent in email notifications and modify your business rules to automatically send that content based on the user's language using dynamic content. If you have Guide Professional or Enterprise, you can enable languages in your Help Center and set up your knowledge base to deliver content in your supported languages. 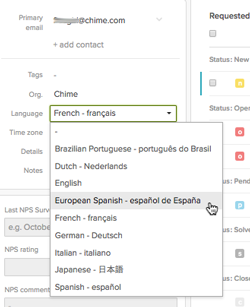 To provide support for multiple languages, you must first select those languages from the list of languages that are available in Zendesk Support. In the Languages section, click Additional languages. Select the languages from the list that you want to support. Your language settings are used throughout Support to help you manage your workflow. For example, you can create automations or triggers that route tickets through your workflow based on the language setting of the requester. Creating a multiple language workflow is described in Using a requester's language in your business rules below. If you have Guide Professional, you can also enable languages in your Help Center and set up your knowledge base to deliver content in your supported languages so that end users can choose the language they want in Help Center. You can set a user's language preference in their user profile (this includes both your staff and your end-users). If present, this setting can be used in your business rules to, for example, determine which dynamic content language variant is used or to route tickets to specific groups or agents. The list of available languages is the same as the languages you selected in the Localization tab of the Account settings page. If the user's language is not supported, they cannot select it. Agents can set their own language preference by editing their profile. Agents with user management permission can set a user's language preference. You can set a user's language with the Set requester's language action, which is available in automations and triggers. Email: The language used in an end-user's email support request is automatically detected. See Detecting an end-user's language from an email message. Help Center (if you have Guide Professional and have enabled your languages in your Help Center): When an unregistered end-user has selected a language in the Help Center, the support request submit form, like the rest of the Help Center, is set to that language. Then, when the end-user submits a support request, the language is identified and their profile is flagged with the language. Web Widget: Zendesk can detect a user's preferred language from their Web browser preference setting. The accept-language header, which is passed via HTTP, contains information about the user's language preference. If that is present, the language can be detected. The auto-detection mechanism is performed on unregistered users only. If user profile language was set previously it can be updated manually by an agent, the end-user, or automatically via an API call. If the user is created via Zendesk Support agent interface or an API call (which doesn't set user language) the default system language will be used. Ticket attributes from system fields are automatically translated into the detected language, but if you want the attributes to be displayed in your default language, you can build dynamic content. Knowing your user's language means that you can use that information to determine how to respond to your users and how to move tickets through your workflow. As described above in Setting and detecting a user's language, there are a number of ways that a user's language can be set or detected. Regardless of how the user's language is identified, it is accessible in automations, reports, triggers, and views via the Requester's language condition. Using this condition, you can, for example, assign incoming tickets to specific groups or agents based on language. You can also create views and reports to track tickets by language. When building a business rule, click the Conditions drop-down selector, then scroll down to the Requester section and select Language. The Requester's language condition allows you to test for a specific language and then act on that information. You also have the option of explicitly setting the user's language with the Set requester's language to action, which is available in automations and triggers. Here are some examples that describe how to use the Requester's language condition and Set requester's language to action to build a workflow based on language. Although it's possible to create a multiple language response within the email body of, for example, a trigger using Liquid markup (described in Using Liquid markup), you should instead use dynamic content. One of the advantages of doing so is that language detection is handled automatically, you don't need to write Liquid markup for each of the languages you support. As described in Using your dynamic content, dynamic content and its language variants can be referenced in many places in your Zendesk Support using a placeholder. In the example in that article, a message describing how end-users can reset their passwords is added to a macro by simply adding the placeholder as the text in a macro action. Based on the user's language, the correct language variant of the dynamic content is used. All of your content (from the welcome message to automated responses in your business rules) should be managed with dynamic content. As you receive support tickets in the different languages you support, you can use automations and triggers to automatically route them through your workflow. 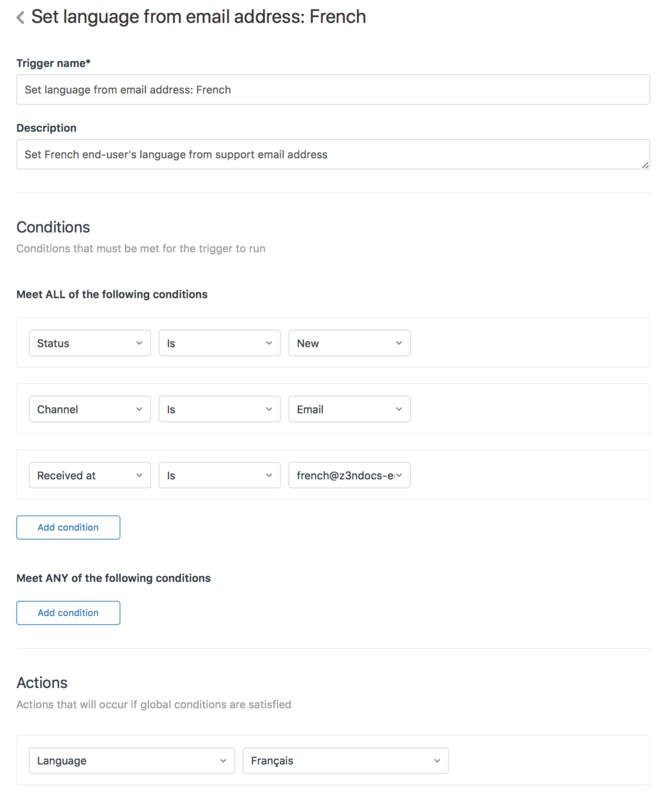 As an example, imagine that your Zendesk Support includes three languages (English as the primary and default language and also French and German). You've structured your organization to support this by creating groups of agents that are fluent in French and German. 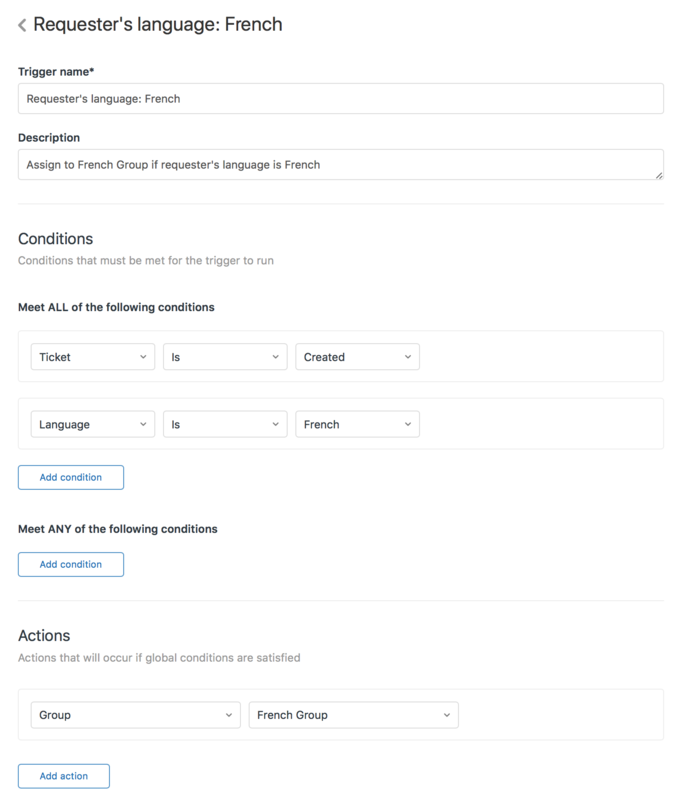 When you receive support requests in either French or German you use a trigger to automatically assign those requests to the appropriate group. This is easily done using the Requester's language condition, which is available in automations, reports, triggers, and views. In this example, tickets from French language users are automatically assigned to the French support group. The Requester's language condition can also be used to create reports and views based on language. You can also make the view visible to agents in a specific group. In this example, the view is only visible to agents in the Italian Support group. This works the same way in reports; use the Requester's language condition to select tickets in a particular language. An end-user's language can be set using the Set requester's language to action, which is available in automations and triggers. You may want to use this action to set an end-user's language in those cases where the source of the support request is not otherwise identified as originating from a specific language. For example, if you use a separate support email address for each of the languages or locales that you support, you can use a trigger to then set the end-user's language based on that email address. In this example, z3nbugulator uses the aide@bugulator.fr email address for its French language users. This email address is forwarded to french@z3nbugulator.zendesk.com, which is the email address used in this trigger. When a user's language is set via the Set requester's language to action, that event is added to the ticket's events and notifications. I am in the process of adding multi-lingual forms to our Help Center, the forms are translated and all appears well in that regard. However, I had assumed that the language indicator in the Help Center url, (e.g. the "en-us" in the url below) would also set the requester language when the form was submitted. Allowing me to automagically assign it to the proper language group. Is there some way to submit the requester language value at ticket creation? I would rather not create new forms for each language, but that would be plan B. The language IS detected from the language identifier in the url! My mistake, I think, was to re-use an existing end-user account (e-mail) when testing forms in different languages. My test user already had a requester language set, so the form language did not overwrite it (which makes good sense) to the "forms language". I'm glad you were able to get it sorted out! Please let us know if you need anything else! We are using 3 different languages and pinned to home articles in Help Center. Our articles are written in English and only displayed in the English version. We would like to display these articles for the other languages, without translation, just displaying the same articles as we are displaying in the English version. Could you tell me a way to do that without recreating all the articles manually for each language? Hi Sami! Once the articles are translated and created, they'll automatically show up in your Help Center based on the end-user's preferred language. However, they do need to be translated and created manually. Zendesk will not automatically translate your articles in one language into other languages. Hi Jessie, Thank you for your answer. However I don't want the articles to be translated. I just want to display the English articles in the other languages automatically, without translation. Is there an option to do that? Hi Sami, Perhaps I misunderstood your question. You want the articles to appear, in English, regardless of which language your readers prefer? Hi there! We are using your Multi Language feature, and realized that the language switcher is only available on the web interface, and not on mobile. Is there a way to make the language switcher available for our mobile visitors? The mobile version of your Help Center unfortunately won't detect your users' language preference, and there's no link to change languages. One way of working around this would be for them to enter the foreign language version of the URL. The other thing you could consider doing is disabling the mobile friendly version of the site so they just view the full site on their mobile device. It's not a perfect option, but it will solve the language issue. You also have the option to customize your Help Center with a responsive theme, which would make your desktop site automatically optimize when viewed on a mobile device. One of our Community Moderator's has written a couple excellent tips about this. Hi I'm having a similar issue to Sami. We added quite a few articles in the default english (us). However it seems that we now have to re-write all the articles again, even thought there is very little difference between these two languages (we are a south african business and therefore prefer to have it noted that we are using south african english though). I see that this is your first post, so let me welcome you to the Zendesk Community! It sounds like you are dealing with a bit of a conundrum there. Unfortunately, even though the languages are very similar, as far as the computers are concerned, they're different languages. In order to change the language, you do have to manually re-create each article. With localization enabled, once you have the content created, Zendesk will automatically serve up the content in the language in which someone is searching (assuming it's one of the languages you have enabled), but there is no built-in automatic translation functionality. Sorry to hear that you've got a big task ahead of you to make this change, but do let us know if you have any additional questions! I was wondering why the (required) text isn't updated to the dynamic language even though the field name seems to be...I don't see how I can update that. Can you help? I think it is, but if you are viewing the form while being logged in the required text warnings are shown in the language your user is set to. Try viewing your web form in incognito / private browsing mode (Ctrl + shift + n in Chrome) that should let you see the form as an anonymous user. Hi, is there a way to create an Insights report or a view capturing tickets created in a language other than English? Reporting on Requester Language parameter does not work for us as some users' tend to submit tickets in English even though their language listed in the user profile is not English. The only thing I can think of would be to create some macros that agents can use to add a tag to the tickets that indicate which language it's in. You can then report on those tags in Insights. Can you tell me more about what you're trying to do? Thanks for pointing it out. I've asked the documentation team to take a look and update if it's inaccurate. Hey Heather! Just wanted to follow up with you to let you know that our Documentation team has confirmed that this article is up-to-date. Please let us know if we can help you with anything!